WonderBang is what International fans called both Wonder Girls (원더걸스) & Big Bang (빅뱅). In Korea, the fans and netizens refer to them as Girl Bang. Both Wonder Girls and Big Bang has 5 members in each group. Big Bang debuted one year earlier than Wonder Girls but the two groups have really bonded over time and are in fact, close friends. Their first ever interaction (at least, on TV) was during Seung Ri‘s (Big Bang) Manwon Happiness and Wonder Girls‘s Star Watch on MNet. Since then, various collaborations followed, which led to a storm overtaking the K-Pop world when the two groups collaborate for a special stage on KBS Music Bank, on 5th October 2007. They performed their hit song, “Tell Me” and “Lies” together. They even won first place for that special stage and performed again for the 2nd time on the 28th December 2007. 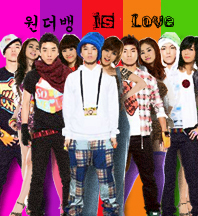 ** Ever wonder why WonderBang is always so colourful? Why is G-Ye red? Why is TooBin green? Etc. Find out here! Yoobin’s nickname is also Snow White, Empress Laugh, and something else.